intellectual property Thierry Raoul Gombet et al. All Copyright © 2013 are guarded by law and by SCIRP as a guardian. is the extravasation of blood into the brain parenchyma. Its incidence is 9 - 15 cases per 100.000 persons . the world [2,3]. It represents 10% to 30% of stroke [4,5]. ICH is the most severe and the most deadly subtype. emergency in Brazzaville University Hospital . the first three months, as well as its impact on prognosis. (M2) and three months (M3 or J90 in French). and 4 cases (1.53%) of subarachnoid hemorrhage. (range 26 to 83 years). Table 1 shows the frequency of various risk factors. 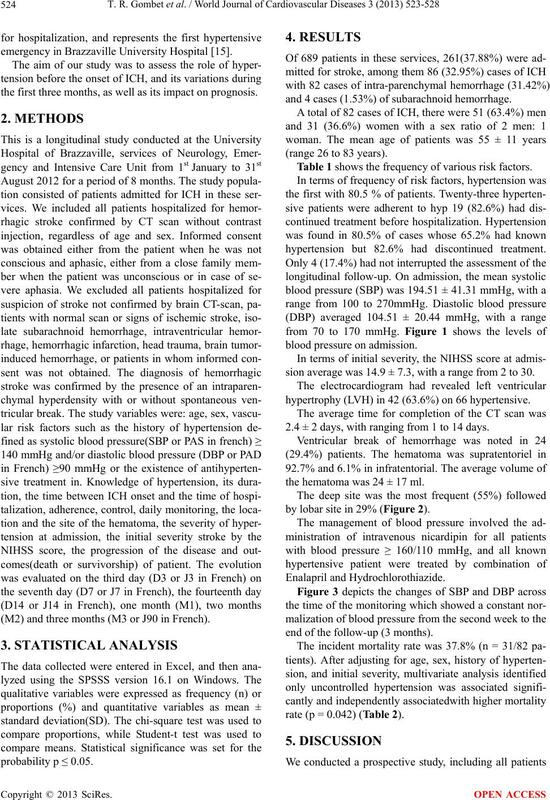 hypertension but 82.6% had discontinued treatment. 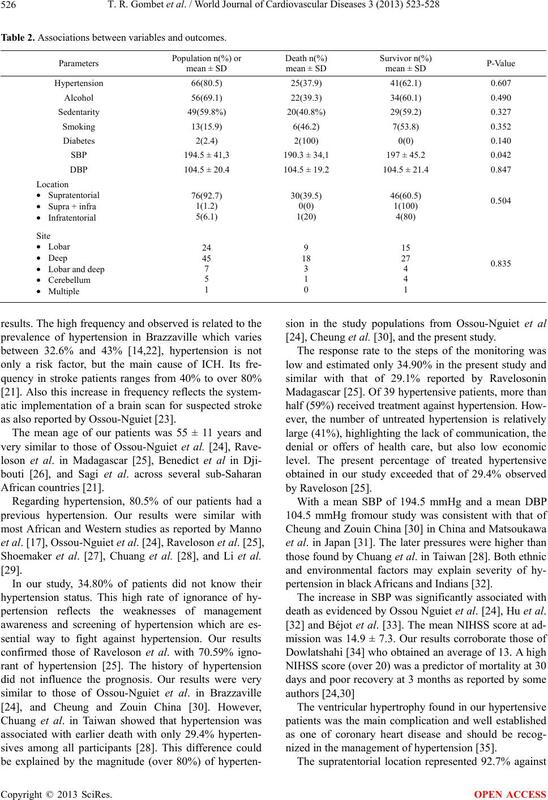 sion average was 14.9 ± 7.3, with a range from 2 to 30.
hypertrophy (LVH) in 42 (63.6%) on 66 hypertensive. 2.4 ± 2 days, with ranging from 1 to 14 days. the hematoma was 24 ± 17 ml. by lobar site in 29% (Figure 2). end of the follow-up (3 months). rate (p = 0.042) (Table 2). Table 1. Frequency of risk factors. Figure 1. Different levels of blood pressure at admission. Figure 2. Distribution of bleeding anatomical sites of the brain. admitted to University Hospital of Brazzaville for ICH. Likewise, this study involved a small number of patients. 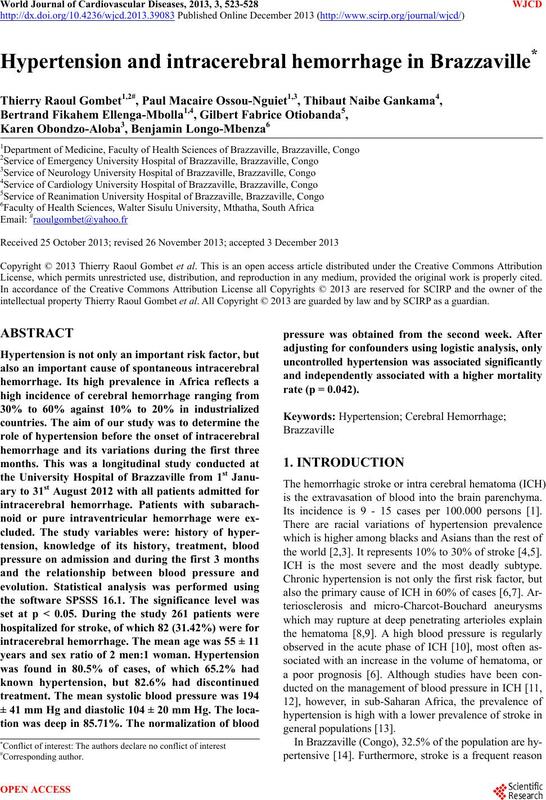 hypertension in cerebral hemorrhage in Central Africa. ings cannot be generalized to the Congolese population. SBP, J = D (day). Table 2. Associations between variables and outcomes. as also reported by Ossou-Nguiet . Shoemaker et al. 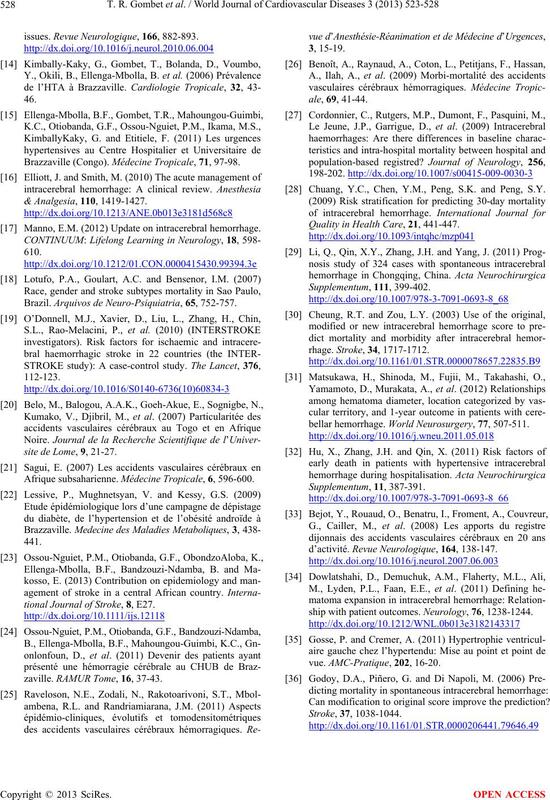 , Chuang et al. , and Li et al. , Cheung et al. , and the present study. pertension in black Africans and Indians . death as evidenced by Ossou Nguiet et al. , Hu et al. nized in the management of hypertension . supratentorial hematoma than infratentorial hematoma. reported by Cheung and Zou  and by Godoy . as described in the literature [30,36], respectively. The mortality rate at 30 days (1 month) was 35.4%. awareness, support and especially patient education. à un service spécialisé: Etude transversale comparative. States from 1979 to 2008. Springer Science, 77, 524-532.
nary Working group. Stroke, 38, 2001-2023.
brain hemorrhage and general management principles. Fisher, C.M. (2003) Hypertensive cerebral hemorrhage. 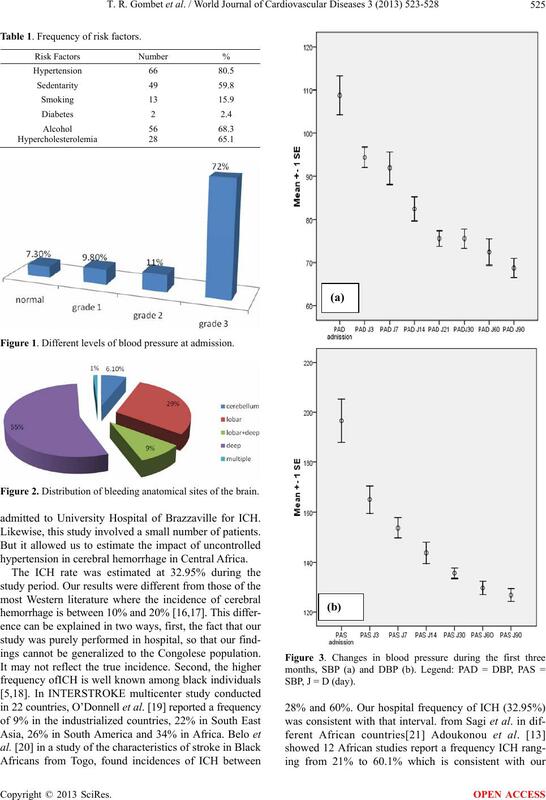 Neuropathology & Experimental Neurology, 62, 104-107.
can Journal of Emergency Medicine, 25, 32-38.
cerebral hemorrhage (ATACH): Rationale and design. randomised pilot trial. The Lancet Neurology, 7, 391-399.
issues. Revue Neurologique, 166, 882-893. Brazzaville (Congo). Médecine Tropicale, 71, 97-98. 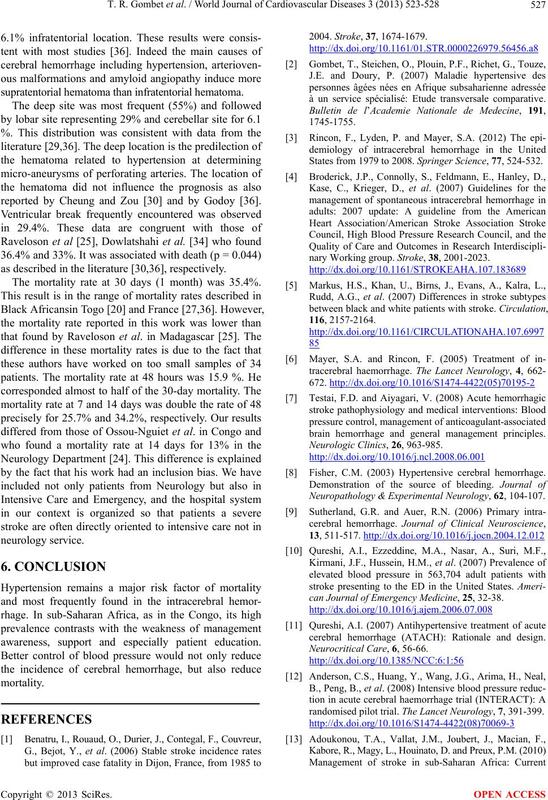 Manno, E.M. (2012) Update on intracerebral hemorrhage. Brazil. Arquivos de Neuro-Psiqui atria, 65, 752-757.
site de Lome, 9, 21-27. Afrique subsaharienne. Médecine Tropicale, 6, 596-600.
tional Journal of Stroke, 8, E27. zaville. RAMUR Tome, 16, 37-43. Chuang, Y.C., Chen, Y.M., Peng, S.K. and Peng, S.Y. Quality in Health Care, 21, 441-447.
bellar hemorrhage. World Neurosurgery, 77, 507-511.
d’activité. Revue Neurologique, 164, 138-147.
ship with patient outcomes. Neurology, 76, 1238-1244. Can modification to original score improve the prediction?